CMU President Eugene C. Warriner (1918-1939) was notable for many reasons, among them his support of the pre-World War I Peace Movement. On November 15, Professor Hope May of the CMU Department of Philosophy and Religion and a group of CMU students participated in a ceremony at the Peace Palace Library in the Hague, Netherlands, where many of Warriner’s documents regarding his beliefs about peace were added to European based website, “Remembering the First World War.” The website is found at http://www.europeana-collections-1914-1918.eu/. 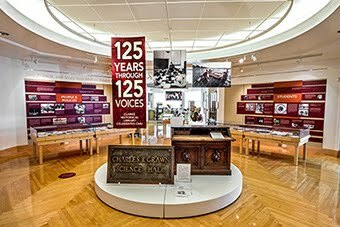 The original documents scanned into “Remembering the First World War” came from the CMU Archives, housed in the Clarke Historical Library. For more information about the Warriner papers carried to Europe, and a photo of Professor May and the students assisting in placing the material into the database, visit the Peace Palace Library blog at http://www.peacepalacelibrary.nl/2014/11/europeana-1914-1918-collection-day/. To learn more about President Warriner’s Papers in the Clarke, view the online finding aid.